On a tour that includes many of South Africa’s favourite ingredients, we also have the opportunity of appreciating this young country’s cutting edge programmes of wildlife conservation and environmental care. 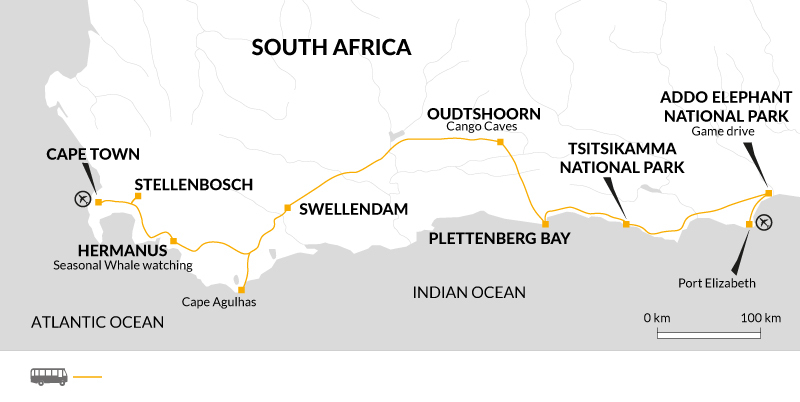 In season, the Southern Right Whale can be observed off the Western Cape, and there is the chance to explore the Tsitsikamma and Wilderness National Parks – plus, of course, to view the Jackass Penguin colony at Cape Point. South Africa is leagues ahead of many developed nations when it comes to environmental care, and its Zero Litter Tolerance in its reserves is widely respected. Transportation on this guided trip includes chartered bus, boat and ample walking – all contributing to a more in-depth exploration, whilst avoiding the harmful impact of fly/drive tourism. Local businesses are widely supported through our use of local suppliers, hotels and restaurants. In addition there is the option to visit the Township at Swellendam – a great opportunity to learn more about the local people.